Horace, the renowned Roman satirist and lyrist, was born at Venusia, in Apulia -- in the country later called the Basilicata, on the 8th of December 65 BC. His father, who had been born a slave, but manumitted before the poet's birth, was a coactor (a collector of money for tax-gatherers and bankers), by which employment he had become a proprietor on a modest scale in his native district. Early seeing the genius and promise of his son, he resolved to devote his whole means to his education, and removing to Rome for the purpose, he gave him the culture usually bestowed on the children of the highest classes. Having finished his youthful studies at Rome, Horace was engaged on higher ones at Athens, when the assassination of Julius Caesar threw the whole Roman world into confusion, and dragged Horace himself -- in his 21st year -- into the civil war which followed. Brutus coming with Cassius to Greece, made Horace a tribune, and he served with the republican leaders in that rank until the fatal field of Philippi put and end to their campaign. Brutus and Cassius destroyed themselves. 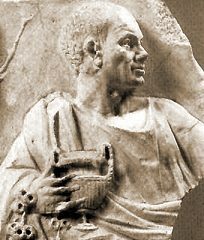 Horace made his submission, and returned to Rome. With what was left of his patrimony he bought the office of public scribe, and while living by this humble place, devoted his energy to literary creation. Thoroughly accomplished in Greek and Roman literature, he set himself to two great tasks -- the naturalization in Latin of the Greek lyric spirit, and the perfect development of the old Roman satire. It is his complete artistic success in both objects which has made him one of the most influential writers of the world, and which will secure his fame as long as order or culture exist upon the globe. Horace's first known labors were satires and epodes -- the epodes being imitations of the Greek satirist Archilochus. But it is probable that he early began to imitate the other Greek lyrists; and it is certain that his first success was derived not from the public but the private circulation of his works. He made the friendship of Virgil, whose rise preceded his own, and of Varius; and Virgil and Varius introduced him to Maecenas when he was about 26 years old. That great Estruscan noble and friend of Augustus became the good genius of the poet's life. He endowed him -- at some period not exactly known, but before 33 BC -- with a farm near Tivoli, in the Sabine country, established his independence, fostered his fame, sought his intimacy, loved, honored, and encouraged him as much as one man could another. The friendship of Maecenas led to that of Augustus, and Horace enjoyed all his life (he died at 57) the consideration of the greatest persons of his time. He shows his gratitude for such favor in many passages of his poems, but he is never servile, and he compliments the emperor himself only on those features of his reign which have tended to secure him the gratitude, or, what was not less needed, the forgiveness, of posterity. It is impossible in a small space to discuss the vexed question of the chronology of Horace's poems, or to notice even a tiny part of what has been written on it. But if we cannot be sure of the chronology of the poems, they give us themselves ample means for judging the character of the poet. Even his personal appearance is familiarly known to us. He was a little, round, dark-eyed man, prematurely gray, and inclined to corpulence; in dress somewhat slovenly, and apt to be abstracted in his gait and manner. He as kindly, friendly, and honorable -- irascible, but easily appeased -- of amorous and generally sensual temperament, yet fully sensible of both the dignity and the prudence of moderation. His philosophy was Epicurean, like that of most Roman men in the world of his age; but he had both an eye and a heart for the noble in history and in life, and his most discerning readers cannot but see that there was a latent fund of earnestness and even piety in his nature, to which his poetry never gave full expression. The real key to his genius, is to study him as essentially a philosophical wit and moralist, who had an exquisite faculty for lyrical creation, and was a finished artist by dint of practice in it, but who primarily belonged to the philosophical rather than to the poetic class of minds. Some strict critics have doubted him being a poet at all, which, since he could produce all the effects of poetry, is plainly incorrect. Other criticisms place his lyrical works -- as imitations of the Greek, and echoes of the natural notes of an earlier and more poetic age -- farther below the Satires and Epistles than it was once customary to rank them. Meanwhile, this neither robs the Odes of their value, nor of their charm, nor of their merit. Their value, as representing an older literature which only exists in fragments, is immeasurable. Their charm, as breathing now all the gaiety, now all the sadness, of the ancient pagan mind, is irresistible. And their merit, even as imitations, implies a delicacy of insight, a fineness of touch, a power of minute finish, which has been exhibited by very few writers in the whole history of art. They are, indeed, perpetual models of construction, equally valuable to poets of every school, and were not less carefully studied by William Wordsworth than by Alexander Pope. Great, however, is the merit of the Odes, that of the Satires and Epistles is still higher. The native Roman satire -- an indigenous product of Italy, as Isaac Casaubon has indisputably established -- was developed by Horace into a branch of composition peculiarly his own, and in his own species of which he has never had a rival. He ridicules the follies of the world from the point of view of a man of the world, and though his morality does not rise above the level of a prudential moderation abhorrent of extremes, he enforces this with so much soundness, dramatic liveliness, and vivacious humorous wit, that the pulpit has profited by him by not less than the author's study, and he has been the favorite of ecclesiastical dignitaries and statesmen, while also being the pocket-companion of men of letters and epigrammatists. The Epistles contain the graver element of the Satires in still greater perfection, and with the addition of a fine vein of persoanl emotion and affection, tinged occasionally with the melancholy of advancing life, which, on the whole, makes them the most valuable of Horace's works. The literature of Horace in modern Europe is enormous, and can only be glanced at here in the briefest manner. The editio princeps appeared at Milan in 1470, 4to, and was followed by a long line of editions. In modern times, Orelli has taken a leading place as Horatian editor, and since him, Dillenburger has been justly popular; while England has contributed to the subject, among other works, the valuable Horatius Restitutus of Tate, and the sumptuous volume of Milman. Among the english translators of Horace, in whole or in part, are found Ben Jonson, John Milton, Atterbury, Alexander Pope, Warren Hastings, and William Cowper, while Pope's Imitations occupy a distinguished place of their own..